Polenta with Mushroom Pomodoro – get into it! Do you ever meet people that you’re just instantly obsessed with? (I mean that in the least creepy way) You just know that after meeting you’re totally going to be friends forever and things just click! That’s exactly how I felt about Sarah Copeland the first time I met her. Well, truth be told, I was a little intimidated because she’s this tall, gorgeous, blond bombshell… but all that aside, I knew we were going to be besties! Fast forward a few years and guess what, she’s a brilliant friend, not to mention one of my favorite people in the food world. Plus she’s an excellent partner in crime when it comes to polishing off a bottle of bubbly and enjoying some of NYC’s best eats. Sarah just came out with her second cookbook – Feast: Generous Vegetarian Meals for Any Eater and Every Appetite – and it’s a beauty. 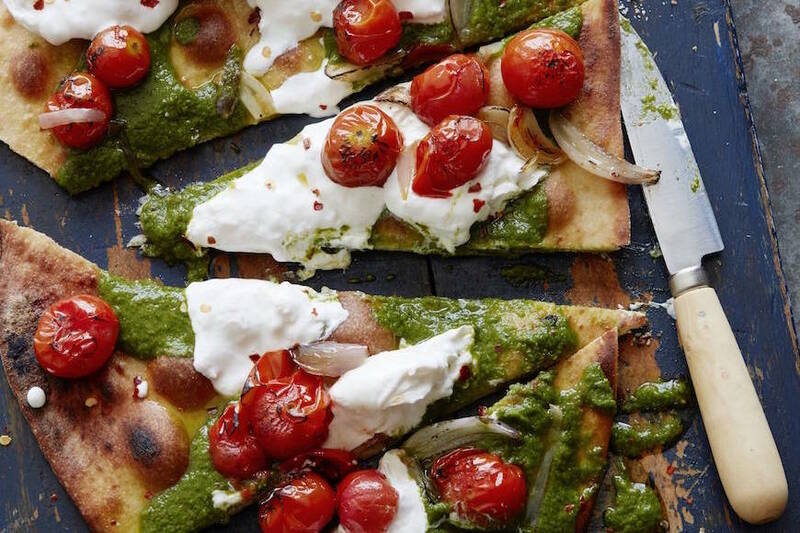 Feast is packed to the brim with vegetarian recipes to please any kind of palate. I’ve read it cover to cover, twice, and bookmarked just about every page in the entire thing. It’s hands down one of my favorite cookbooks to date. The Polenta with Mushroom Pomodoro was seriously calling my name. Minus the fact that I never actually make polenta – I knew that this one was up first. Why, you ask, do I never make Polenta? Who knows! I’m a weirdo, it scares me a little bit, and my mom never made it for us as kids. Which basically means it’s not the first thing I think of when figuring out what to make for dinner. But after whipping up a batch from Feast, I can promise you that that is no longer the case. Polenta + Mushroom Pomodoro + Thyme…. I’d say that it’s an epic meal. And one that I won’t soon forget. Also – Polenta with Mushroom Pomodoro stop motion food styling on instagram… say whaaaaat! 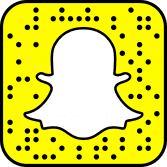 You have to check that out. Vegetarian or not, I’d say this cookbook is an absolute must for anyone who loves food! Two thumbs up from the What’s Gaby Cooking kitchen – and it should totally go on your holiday wish list. Also, I hope my husband doesn’t mind eating vegetarian food for the next month as I work my way through each and every chapter!! Bring the water to a boil in a medium saucepan over medium high heat. Slowly add the polenta, stir with a wooden spoon, and add 1 tsp salt. Reduce the heat to medium and cook, stirring occasionally, until the polenta is tender and full cooked, about 20 minutes. Add the milk, 2 tbsp of the butter, and the Parmigiano-Reggiano cheese to the polenta and stir together over medium-low heat until just warmed through and soft enough to drop easily from a spoon, a few minutes more. Cover to keep warm. Meanwhile, heat a large skillet over medium heat. Add the olive oil and mushrooms and cook until they begin to brown and release their liquid, about 5 minutes. Raise the heat to medium-high and cook, stirring occasionally, until the mushrooms are crispy but still juicy, seasoning with salt and pepper toward the end of cooking. Add the shallot, garlic and thyme and cook 4 minutes more. Add the half and half and the Cognac. Reduce the heat to medium and cook, stirring frequently, until the liquid thickens just slightly and coats the mushrooms evenly, a few minutes more. Discard the thyme sprig and stir in the remaining 2 tablespoons of butter. Taste and season with more salt and pepper as needed. Spoon the polenta into bowls and top with the mushrooms and sprinkle with herbs if desired. I can’t believe how stunningly beautiful this book is. It is one of my new favorites without a doubt. This polenta is calling my name!! LOVE this. I was just reading about how to host a polenta party, and the only problem I had with the presentation was laying butcher paper on my old teak table. Now I am going to do it and break out the marble. 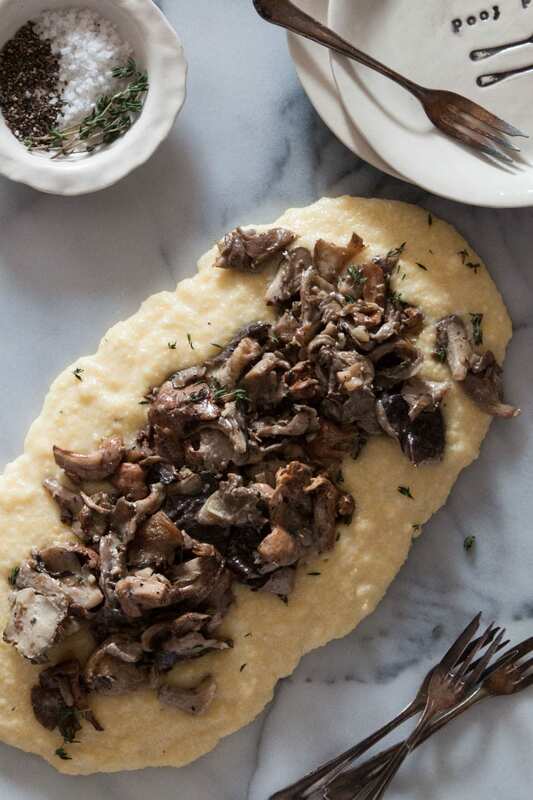 Great recipe – polenta and mushrooms are kind of made for each other! Holy Polenta, Batman! This cookbook is going on my Christmas wish list. Hear me, Mr. G! I’ll be making this asap. Thank you for sharing. Erin, I deeply approve of your Christmas list! 🙂 I hope you get everything on your list! This is total comfort food in my book! I love polenta with mushrooms, must try! What a beautiful book and and an equally beautiful dish! I love polenta, especially with mushrooms. Yuuuuummmmm. My absolute favorite restaurant dish here in SD is a ragu of the day over mascarpone polenta. 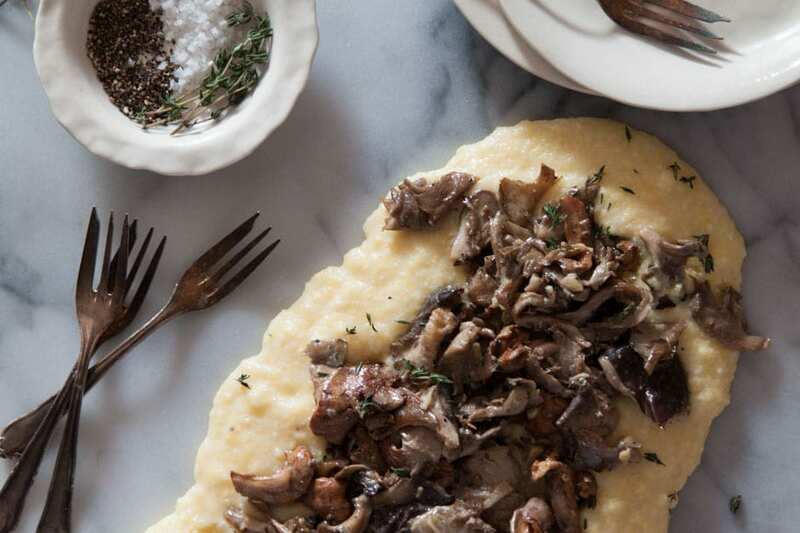 The hearty flavor of mushrooms (or ragu) with creamy polenta is magic. Sigh….mothers always get the blame! Glad you remedied your polenta situation! This looks beautiful. And yummy! I love how your served this! Those mushrooms have my name written all over them! 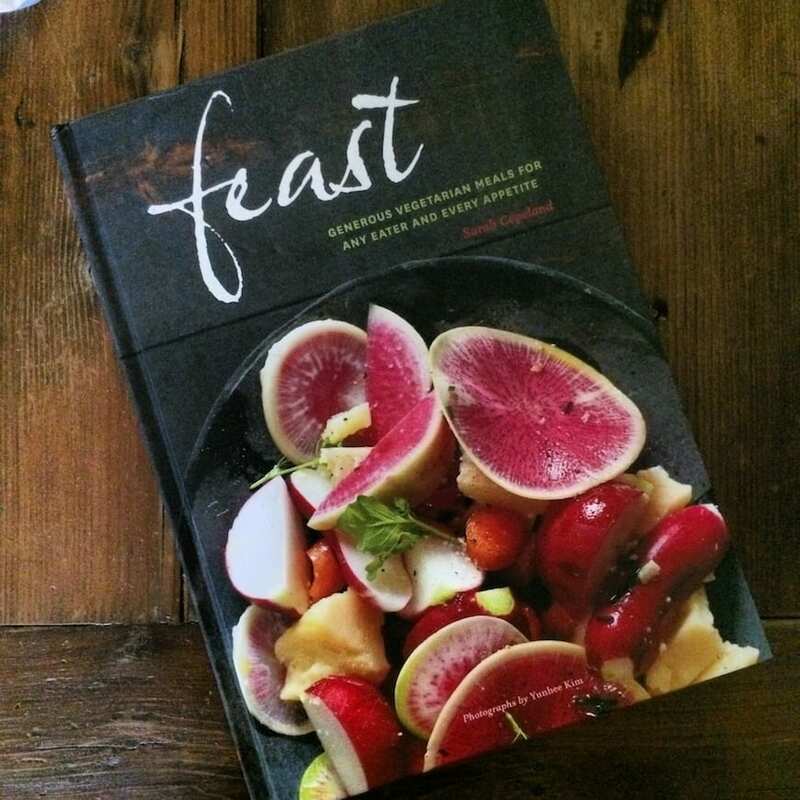 I’ve made several recipes from Feast (all have been huge hits), but I haven’t gotten to this one yet. Adding it to my “to do” list. You make it look so gorgeous, Gaby. Holy yum! I could go for a big portion of this gorgeous, hearty pomodoro for dinner! Thanks for this recipe and for writing about this cookbook. Can’t wait to get my hands on it. I’m weird-I like to clean silver. Please tell me that you do not eat with those forks! I’ve never made polenta either (and same here, Mom and Dad never did), but am inspired to now by the both of you! Gorgeous! 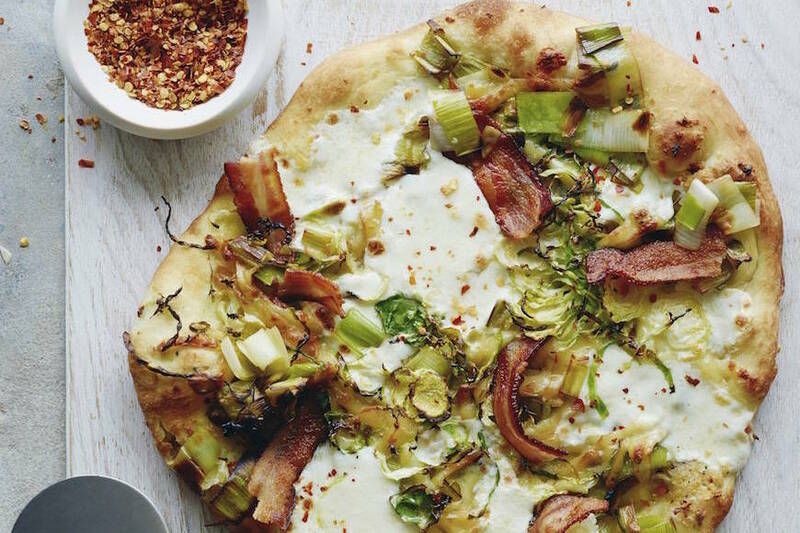 This cookbook is totally on my radar! Huge polenta fans over here. I can eat polenta with every meal. Love that this is with shrooms!! sorry if i am asking a silly question but “add the half and half” of what (1/4 cup half and half). it is not the first time i read something like this in a recipe. Ok, this looks perfect! Love your recipes girl! This looks so rich and dark, sinister delicious… can’t wait to try it! Can’t say no to a bunch of mushrooms! I am literally drooling over this!! I also need to get my paws on that book – I love meatless dishes that don’t taste like they’re lacking any meat!! oh YUM! I love this and can’t wait to get my hands on her book! I marked this one as well. 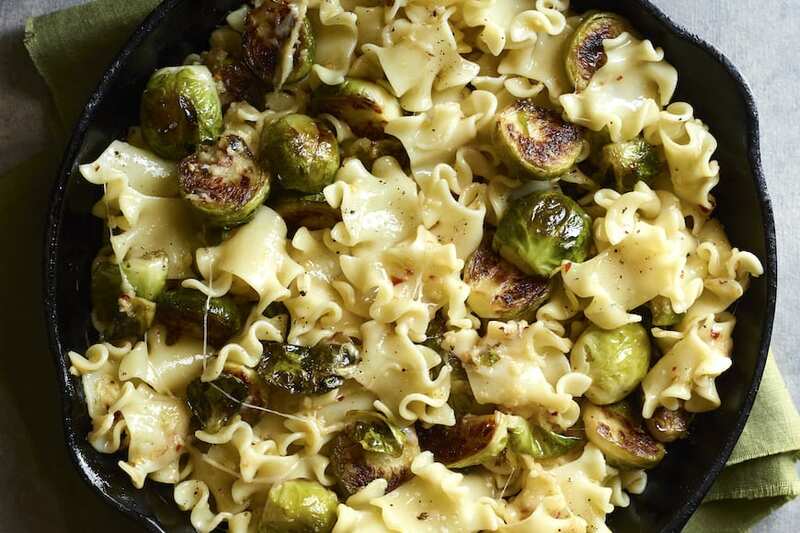 I will be making this for my next alone-time meal…I don’t want to have to share with anyone! I am scared of polenta, too!! I am totally with ya’ on that. I would try this recipes one of these days, though. I’ll add it to my recipe to do list! I love mushrooms but usually have to sneak them into foods to get the family on board. Even thn, they have no ideas they are on board, altitude increasing to 30,000 feet! Ya know?! So I’ll have to figure out a different topping or maybe a way to sneak in my beloved mushrooms. * funny thing is, I say altitude rising, because they are ON the ride, LOVING IT! So long as they don’t actually ::know:: they are loving it because of the mushrooms. Crazy, huh!? Needs both this book and this dish. I adore polenta, and this looks so creamy and satisfying. I’m confused. Pomodoro is Italian for tomato, but there’s no tomato in this recipe?